HandKrafted by Stephanie: CR84FN9 and Some Fun News! CR84FN9 and Some Fun News! Hello! Happy 2011! I'm starting the new year off with a challenge and some fun news! 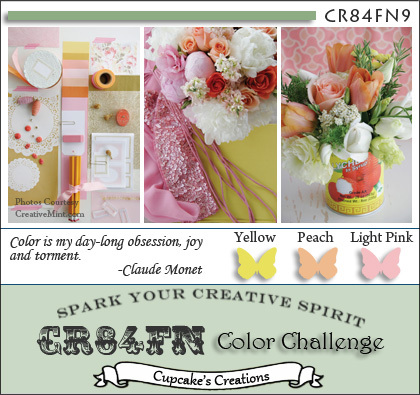 As many of you stampers may already know, Mona started hosting her own CR84FN (aka Create For Fun) color challenge a couple of months ago on her blog. She is kicking off the new year by moving it to a brand new site, and she invited me to join her design team! Of course, I said YES! For this week's challenge (CR84FN9), Mona has chosen the lovely color palette of Yellow, Peach and Light Pink. The photos in the graphic above are courtesy of http://acreativemint.typepad.com/. These colors made me think of spring, flowers and butterflies, so I decided to use Dawn McVey's Signature Series: Butterfly stamp and coordinating die (Papertrey Ink). 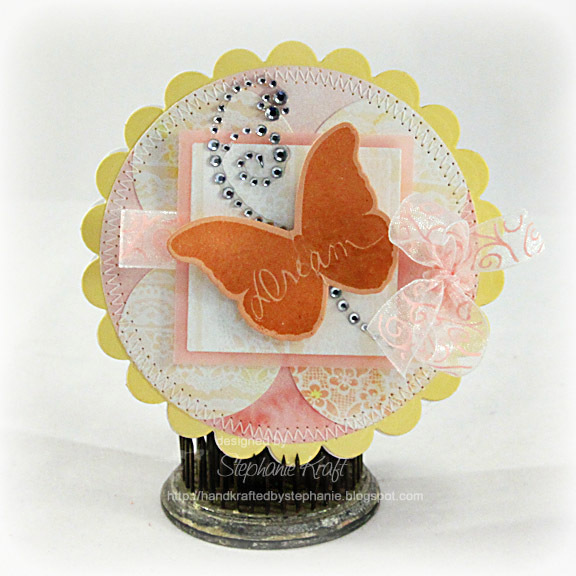 I clear embossed the butterfly onto the die cut Melon Berry cardstock. I added a bunch of layers, some stitching, ribbon and a rhinestone flourish. For all the challenge details, please be sure to visit the CR84FN blog HERE. Mona's hubby, Scott, has done a fabulous job designing the website and graphics! I hope you will join us this week.. I can't wait to see what you create! Accessories Signature Series: Butterfly die (Papertrey Ink), Nestabilities: Standard Circles, Standard Scalloped Circles, Classic Squares (Spellbinders); Ribbon, Rhinestone flourish, Clear embossing powder, Foam tape, Thread, Sewing machine. How pretty! The MoJo Monday sketch looks wonderful with this weeks CR84FN colors. Love teh added butterfly and flourish gems! LOVE the unique shape of your card! It is so LOVELY! The stitching and that FAB ribbon are such great details! LOVE the butterfly! Gorgeous card...love the color combo!! Stephanie - this is beautiful. I love the shape and the butterfly, ribbons, layers - so shabby chic!! What a beautiful card! Love how you interpreted the sketch. The butterfly is the perfect focal touch. Fabulous spring card with all it's sweet details! Love thinking spring on this frigid winter day in the desert! Congrats too on your DT selection!!! Gorgeous, love the scalloped circle card, and the pretty ribbon and gems are lovely. Congratulations on your new DT post! This is darling! I love the color combo!! Congrats on making the DT!! Congratulations, Stephanie! Love your first project for this fun challenge! Gorgeous card, Stephanie! Love the shape and your worked these springy colors so well!!!! LOVE this!! So very pretty! GORGEOUS card Stephanie! A real eye-catcher!!!! It really drew my attention on the CR84FN blog - WOW!!! Your stitching is perfect! You created a stunning, soft card with this beautiful color combo! And how much do I envy this fabulous round card?! I can't make a round card to save my life LOL!!! Great job girl! Beautiful and sweet! Love the gorgeous shape and the ribbon and butterfly! Great job and very inspiring! Wow-ers girl, this is so PRETTY! It's beautiful card Stephanie!Love it! Congrats! Happy New Year to you!